Make a great impression with high quality ring binders printed with your own designs. Custom ring binders are not just for organising your paperwork, they’re a wonderful way to keep and display special notes, pictures and samples for all kinds of purposes, from weddings, interior design and crafts, to school, college or business. 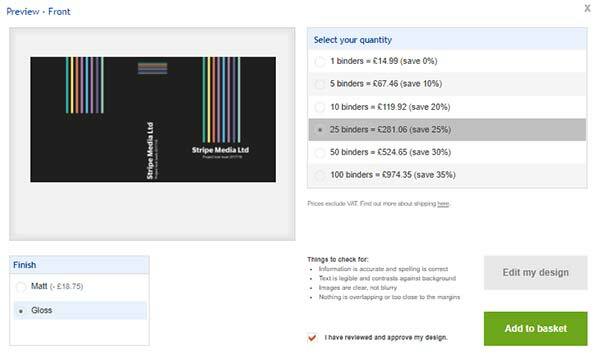 Select ring binders from our products menu and choose the size, width, closing mechanism, finish and quantity – the more you order, the greater the discount. Then click on the bottom right blue button: Start designing yours now. This will open the Avery online design tool. To use your own design, click on Add a PDF further down the same menu. •	Personalise the template, by clicking on the part you want to change. 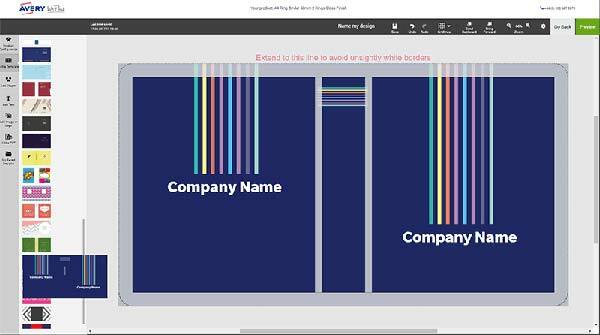 A content box will appear around it and you can use the editing options that pop up in the panel, depending on whether it’s a shape, text or image. 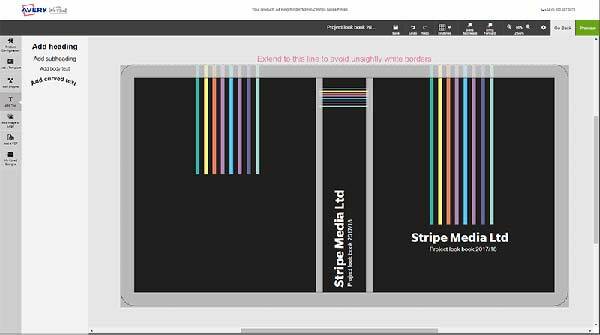 •	Add shapes, text and images and logos, using the left-hand vertical menu. •	Alter the size by placing your cursor on a corner of the box. •	Change the text font, size and alignment on the editing panel that pops up when you click on a text box. Use the More option to change the text angle and opacity (make it feint). •	Add an image or logo – upload a jpg, png or pdf file using the left-hand menu option. Once uploaded, your images are visible on the left and you can drag and drop them onto your ring binder. •	Undo or redo your last actions, and add gridlines to guide you using the menu at the top. •	If you want more than one content box in the same place, use the Send to back or Bring forward buttons in the top menu to control which item is ‘on top’ of the others. You can also adjust the zoom and settings for tooltips using this menu. Click the green Preview button in the top right corner to see how your design looks. You’ll also have the option to switch between a matt or gloss finish and change your quantity. There’s a handy checklist here to make sure it’s all OK. If you want to change anything, click on Edit my design to go back to the design tool. 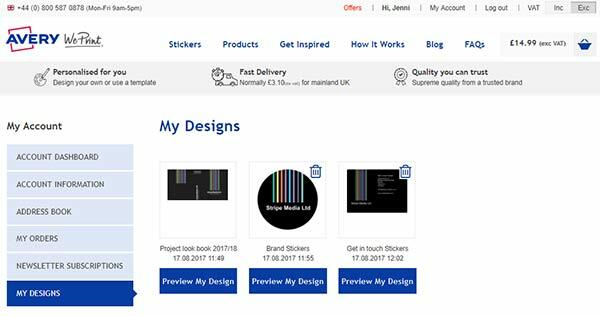 If you’re happy with it, tick the box I have reviewed and approved my design and then Add to basket and proceed to the secure checkout. Not ready to order just yet? Simply go back to the design tool and click on Save in the top menu. You’ll be asked to create an account if you don’t already have one. To get back to your saved design another time, click on Login / Register at the top of the Avery We Print website, then select My Account and then My Designs at the bottom of the left-hand menu to see your previous ring binder designs. Good luck. And if you’d like to show us your finished ring binders in use, just get in touch or find us on Facebook.